The greenhouse consists of an anodised aluminium frame and double-walled panels and is ideal for creating a controlled environment for plants. The polycarbonate used is UV-resistant and solid, and up to 40% more heat-insulating than glass. 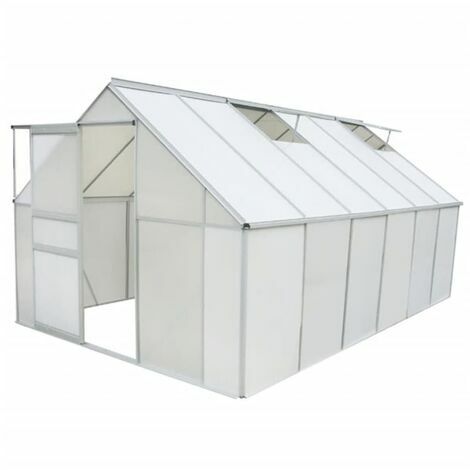 The greenhouse has a strong and maintenance-free aluminium construction and is easy to assemble. It has two roof hatches for ventilation and a sliding door for easy access. Tip for placing the greenhouse: Our greenhouses are delivered without a foundation. When placing a greenhouse, a good, solid foundation is important to protect the greenhouse from being moved by rising groundwater or collapsing due to extreme dryness of the soil. You can easily create a foundation yourself by attaching the greenhouse (with screws, for instance, as that would form the most solid connection) to beams made of stone, aluminium or wood. When you dig these beams ± 10 centimetres into the ground, your greenhouse will be better able to withstand strong winds.